Kara, daaaahling, I’m so sorry I’m late. Yes, yes, I know the party started eons ago, but my dear Felix absolutely insisted I stop by the market to pick up some blackberries for my perfume. The scent drives him wild with passion, and you know I simply can not deny him anything. Oh, thank you, a margarita, what a wonderful idea. I am feeling a bit muddled from my trip. Your book party is a smashing success, my dear! I haven’t seen so many well-dressed peppers in one place since my cotillion. Had I not been introduced to Felix then, I’d probably be living in sin with that dark, handsome Fiery Almond. Too bad he decided to take up with the Sparkling Ginger Daisy triplets. I understand they liven up a party, but they’re certainly no match for my voluptuousness, hmm? Oh look! There’s Rhubarb Cooler over in the corner. I haven’t seen her since last spring (I hear she might have had some work done), helloooo, dear! Oh, and Red Dawn, how are you, sweetheart! Simply love your dress! I am so glad you didn’t invite that Cosmo girl; she’s been an absolute pill since she had that show on cable. What’s that? My poblanos? Oh, how kind of you to ask. They are turning into fine, strong little men, although they do have a temper. They take after their mother. I suppose that Latin spiciness runs in my side of the family. It is just wonderful you decided to feature me in your book, daaahling, and with such a flattering photograph. I look nearly as sweet and luscious as I am in real life! At least I’m told so by several people I’ve given the book to. I think it’s the purple blouse; it sets off my eyes. I’m sorry, but I must run. Now, now, don’t let me make you pucker like that. I would stay, but Felix has demanded a taste of tequila as soon as possible. Mine, in fact. Ha! Ha! Oh, Kara, how you blush. Tah, tah, daaaahling, and thank you for a wonderful time. I am so looking forward to your next party! 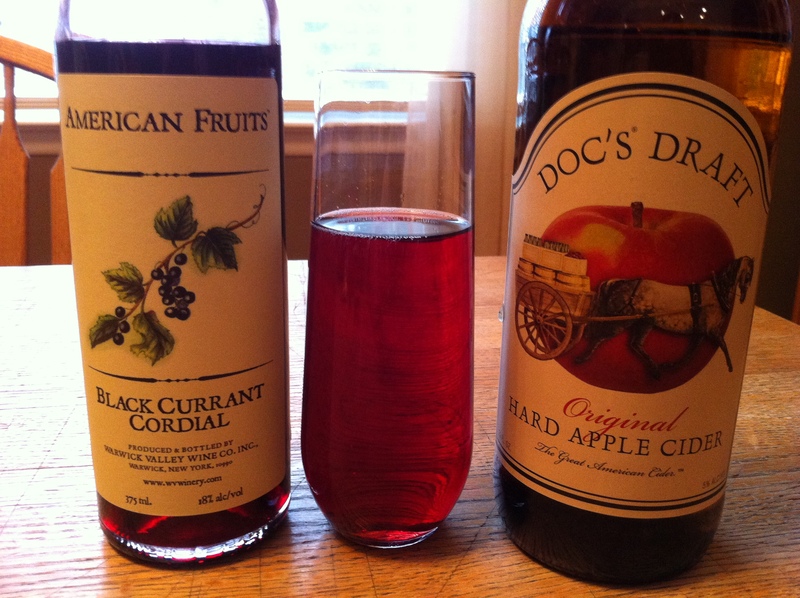 The luscious purple color of this drink is a stunner! Taste a berry first to check for sweetness. 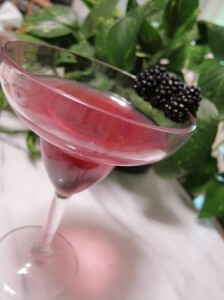 If it’s not supersweet, add a tablespoon of sugar when muddling the berries. 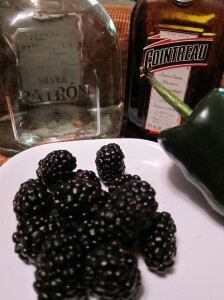 In a cocktail shaker, muddle the blackberries and poblano peppers. Shake with the tequila, Cointreau, and ice. Strain into a martini glass. Note: If working with fresh blackberries, raspberries, or blueberries, to avoid pulp or seeds in your glass, strain before serving. Blackberries not in season? Use frozen berries. The Blackberry-Poblano Margarita has a herbacious quality from the poblanos, and an earthy, almost tropical flair from the blackberries. This is an ideal summer evening party cocktail. It will knock your guests socks off, possibly literally. Between the spice and the tequila, it is not for the faint of heart. 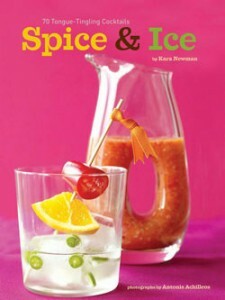 Kara Newman, author of Spice & Ice: 60 Tongue-Tingling Coctails, is the generous host of this virtual cocktail party. Visit her site to see what others have shaken, stirred, muddled and mixed. I highly recommend her book of savory and sweet cocktails with a kick. It makes a unique gift, and is a wonderful addition to anyone’s library.